Much attention to energy efficient alternative cars focus on the all-electric Tesla Roadster and Model S sedan, the controversial Chevrolet Volt from General Motors, along with a variety of hybrids from many well known manufacturers. This past week, I encountered Myers Motors’ NmG in San Francisco. 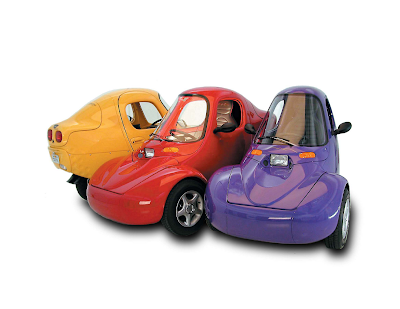 This three wheel one seater has a top speed of 70-75 miles per hour and supports a driving range of about 50 mile. The vehicle started its life in 1996 built by Corbin Motors of Hollister, California. Legend has it that Domino's Pizza had plans to use it as a delivery vehicle. In the end, Corbin Motors filed for bankruptcy in 2003 with Tallmadge, Ohio based Myers Motors bringing the project back to life in 2004. You may have seen a variation of the NmG (No More Gas) in the Austin Powers film Goldmember. The economics of electric cars are still evolving and investments continue. This past September, MidAmerican Energy Holdings, a subsidiary of Berkshire Hathaway invested $230 million for a 10% stake in China's BYD Auto's e6 all-electric automobile which has a driving range of about 250 miles on a single charge.